The Global Volcanism Program has no activity reports for Kueishantao. The Global Volcanism Program has no Weekly Reports available for Kueishantao. The Global Volcanism Program has no Bulletin Reports available for Kueishantao. Kueishantao Island, whose summit is 401 m above sea level, is the southernmost of five small volcanic islands off the NE coast of Taiwan. Kueishantao, also known as Guieshan Island, consists of andesitic lava flows and volcaniclastic material. It is the southwesternmost volcano along the axis of the Okinawa Trough back-arc basin that extends to the NE from Taiwan to Unzen volcano in Kyushu. The SW tip of the Okinawa Trough extends past Kueishantao onto the Ilao Plain on the island of Taiwan. The island is known as "Turtle Mountain Island" due to its profile as seen from some points on the coast of Taiwan. Historical accounts during the time of King Qianlong of the Qing Dynasty (1775-1795 CE) noted the Guieshan mountain split open with a blood-red lava flow. Kueishantao displays vigorous active submarine fumaroles and solfataras that discolor seawater over wide areas. Chen C H, 1981. Petrochemical aspects and tectonic implication of Pleistocene andesitic rocks of northern Taiwan and off-shore islets. IAVCEI 1981 Tokyo Mtg Abs, p 50-51. Chen C-H, Lee T, Shieh Y-N, Chen C-H, Hsu W-Y, 1995. Magmatism at the onset of back-arc basin spreading in the Okinawa Trough. J. Volcanol. Geotherm. Res., 69: 313-322. There is no Deformation History data available for Kueishantao. There is no Emissions History data available for Kueishantao. Vigorous submarine fumarolic activity discolors water over broad areas around Kueishantao Island (also known as Gueishan Island) off the eastern coast of Taiwan. 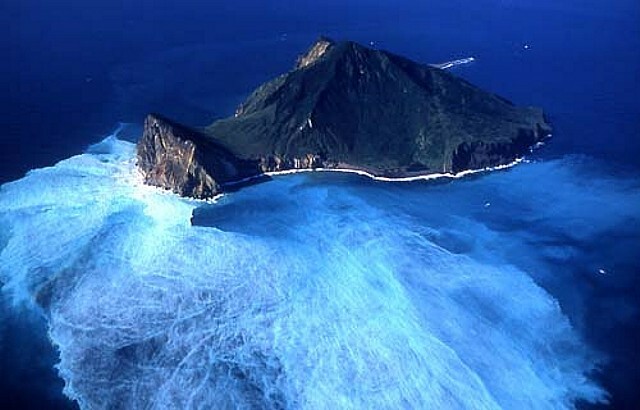 The island is known as "Turtle Mountain Island" due to its profile as seen from some points on the coast of Taiwan. Historical accounts during the early years of King Qianlong of the Qing Dynasty (1775-1795 CE) noted that the Guieshan mountain split open with a blood-red lava flow. Copyrighted photo, 2006 (Tourism Bureau, Republic of China (Taiwan)). There are no samples for Kueishantao in the Smithsonian's NMNH Department of Mineral Sciences Rock and Ore collection. Large Eruptions of Kueishantao Information about large Quaternary eruptions (VEI >= 4) is cataloged in the Large Magnitude Explosive Volcanic Eruptions (LaMEVE) database of the Volcano Global Risk Identification and Analysis Project (VOGRIPA).